The “Castagno” (chestnut tree) vineyard at Pieve Santa Restituta. Vineyards: Santo Pietro, Castagno, Pian dei Cerri. Fermentation: 4 weeks in stainless-steel vats. Aging: Twelve months in barrique (first-, second-, and third-passage casks), 12 months in botti (large thirty-year-old casks). 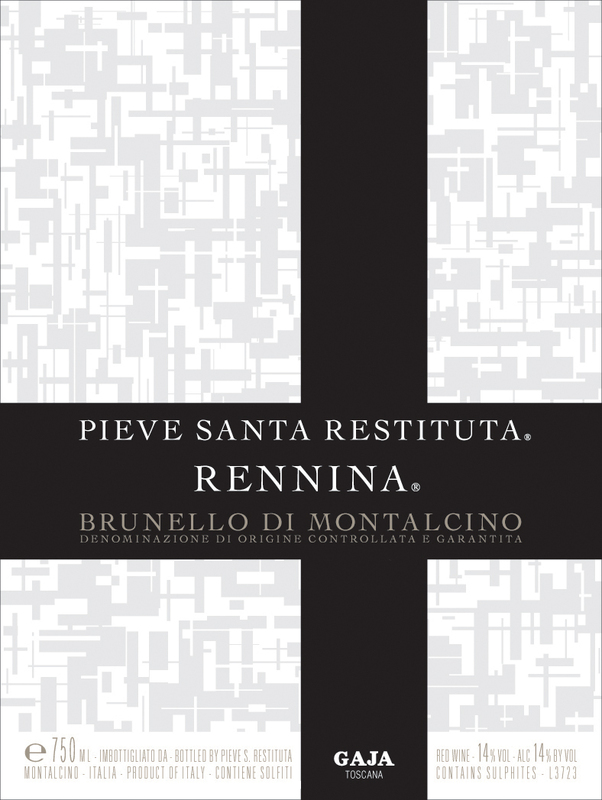 Vineyard notes: The designation Rennina (rehn-NEE-nah) first appears in the High Middle Ages and is derived from the late-Roman name of the estate, Fundus Rescianum, denoting a state-owned farm. Since the Gaja family’s acquisition of the historic estate in 1994, three growing sites have been devoted to the cultivation of Sangiovese Grosso grapes for the production of Brunello di Montalcino: Santo Pietro (St. Peter), Castagno (Chestnut Tree), and Pian dei Cerri (Turkish Oak Flats). Here, lime-rich subsoils, southwest exposure, and ventilation arriving from the Tyrrhenian sea to the west deliver well-balanced Brunello di Montalcino, defined by its characteristic red fruit notes, minerality, and polished tannin.